Searching for the best trekking shoes for women, leads you all the technicalities and brands of trekking shoes. Let’s gear up to flare your adventure spirits. Trekking, being an adventure sports pushes our limits. It acts as the self-recognition exercise. The mountain lover women have the natural inclination for the trekking. So they have to be aware of the trekking gears as well. 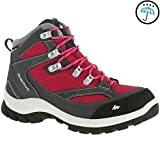 When you are searching for the best trekking shoes for women, you have to be well-informed about the trekking shoes for women available in the Indian market. Although, less Indian women have inclination for adventure sports like western people, the numbers are increasing. In the last five years, the number of searches on trekking shoe for women has been significantly improved. Why should I research on the best trekking shoes for women? Trekking, being an adventure sport, needs your physical stamina to climb the mountain. In addition to the physical fitness in trekking, the essential gears play a cardinal role in the journey. The uneven, rocky trails can bruise your feet. Apart from that, slippery boulders are equally dangerous to break your bones. Therefore, few qualities like – traction, waterproofing, gripping, etc. are essential to consider when you are looking for the best trekking shoes for women. 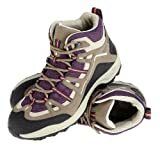 Women's Waterproof Mountain Hiking Shoes MH100 Mid – Brown - It’s one of the best trekking shoes for women to trek at all weather conditions. This mountain hiking shoe is highly durable and comfortable for your feet. It has cushioning and stone guard to protect your feet. Along with that, it has good support and water-proof membrane. CrossContact sole is an excellent grip for dry and slippery trail. It has a full length cushioning with EVA midsole. Waterproof and breathable membrane to keep your feet dry. Stone protection to save your feet from bruise. It is a light-weight shoe (380 gm). Women's Hiking Shoes NH100 - Blue Pink - This is a low budget hiking shoe for women. The beginners who do not want to spend much initially can invest in this hiking shoe. This shoe is appropriate for short hiking on a dry day. The CrossContact sole provides a good grip on a slippery terrain. It’s not waterproof. Low budget shoe for the beginners. It is a light-weight shoe (311 gm). 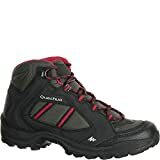 Women’s Snow Hiking Shoes SH100 Warm Mid – Black - This snow boot for women is warm and waterproof. It has a rubber-made SnowContact sole which offers you a better grip while walking on the snow. The shoe looks stylish and durable at affordable price. It makes your feet comfortable and warm at minus temperature. This shoe is made of breathable and waterproof membrane to keep your feet dry. It has the space to wear 3mm crampon. 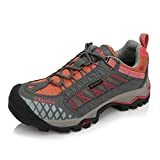 Women’s Nature Hiking Shoes NH300 Waterproof Mid – Green/Khaki - It’s an entry level trekking shoe for women to trek at all weather conditions. This mountain hiking shoe is the best for occasional wear and comfortable for your feet. It has cushioning and stone guard to protect your feet. Along with that, it has good support and water-proof membrane. It has Honeycomb sole and insole for better feet support. It is a light-weight shoe (370 gm). Traction Essensole for good grip. Cushioning shock absorption system for durability and high performance. High ankle shoe to protect your ankle. It is a light-weight shoe. Omni-grip technology to offer you confidence on any trail. Omni-tech technology for air-permeable membrane for water-proof and breathable solution. Tech-lite is the long lasting and cushioning mid-sole to support your feet at any terrain. The shoe has the combination of leather, mesh and webbing. TRACTION TPU sole with 5 mm lugs for good traction. CUSHIONING Full foot PU midsole: durable and high-performance. WATERPROOF Breathable and waterproof Novadry membrane keeps your feet dry. FIT High upper with two hooks on top provide excellent support on any terrain. Breathable and Waterproof Novadry membrane to keep your feet dry. Shock absorbing EVA midsole for better performance. Uneebtex waterproof membrane to keep your feet dry. Sanitized and Actifresh technology to keep your feet germ free after long time wearing. It consists skid-proof and abrasion-resistant Rubber outsole.